Each bud opens to reveal layers of candy pink petals with dark speckles, but without the pollen. Allergy sufferers can enjoy the blooms without the sneezing and watery eyes. Excellent choice for a naturalized perennial bed or patio pots. Bloom Time Early to mid summer. Foliage Type: Dark green, lance shaped, 3-4" long in whorls around the sturdy stems. 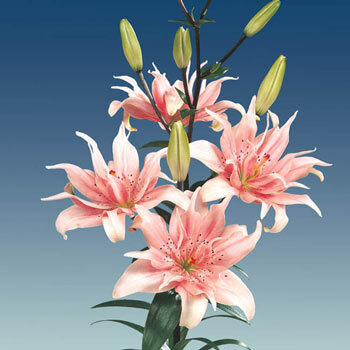 Flower Form: Large flowers with layers of petals to give a double bloom look. Planting Instructions: Plant 6" deep and 9-12" apart. Soil Requirements: Prefers moist but well drained soil. Pruning: Don't remove leaves until they have died down in the fall. 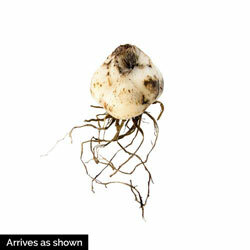 They help provide nourishment to the bulb for next season's blooms. Late fall. Winter Care: Mulch +/- 2" leaving a layer of mulch on during flowering season. 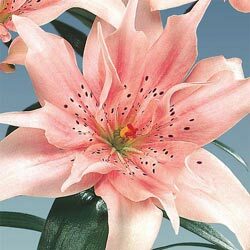 Additional Information: Elodie Asiatic Lily has no pollen.